Authors: Jadidi, M. M.; König-Otto, J. C.; Winnerl, S.; Sushkov, A. B.; Drew, H. D.; Murphy, T. E.; Mittendorff, M.
Abstract: Subwavelength graphene structures support localized plasmonic resonances in the terahertz and mid-infrared spectral regimes. The strong field confinement at the resonant frequency is predicted to significantly enhance the light-graphene interaction, which could enable nonlinear optics at low intensity in atomically thin, subwavelength devices. To date, the nonlinear response of graphene plasmons and their energy loss dynamics have not been experimentally studied. We measure and theoretically model the terahertz nonlinear response and energy relaxation dynamics of plasmons in graphene nanoribbons. We employ a terahertz pump–terahertz probe technique at the plasmon frequency and observe a strong saturation of plasmon absorption followed by a 10 ps relaxation time. 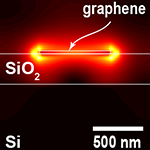 The observed nonlinearity is enhanced by 2 orders of magnitude compared to unpatterned graphene with no plasmon resonance. We further present a thermal model for the nonlinear plasmonic absorption that supports the experimental results. The model shows that the observed strong linearity is caused by an unexpected red shift of plasmon resonance together with a broadening and weakening of the resonance caused by the transient increase in electron temperature. The model further predicts that even greater resonant enhancement of the nonlinear response can be expected in high-mobility graphene, suggesting that nonlinear graphene plasmonic devices could be promising candidates for nonlinear optical processing.